The photograph of a young, female graffiti artist next to a piece of graffiti that reads “Breast Cancer Awareness” is a reflection of a community longing to be heard. The history of breast cancer is one of shame and silence. Although many cases of breast cancer are documented throughout history, it was not until the 20th century social movements concerning breast cancer that the majority of the public became aware of the severity of this disease. In the past, breast cancer was treated with radical surgeries, known as full mastectomies, which ultimately resulted in the removal of not only the cancerous tumors, but both breasts. Traditionally, women with breast cancer did not speak out about these horrific surgeries and treatment. A Foucaultian understanding of this behavior is that medical control over illness leads to the patient feeling a sense of disempowerment and blame for various illnesses. Such feelings are further exasperated due to the fact that many medical treatments resemble that of a punishment. In addition, the lack of public knowledge of diseases may leave the patient feeling inadequate and unequipped to question medical authority. The vicious cycle of silence had led to nothing but a lack of medical research and more breast cancer deaths. Currently, breast cancer is the second cause of death in women in the Western world, thus silence towards this gripping disease is no longer an option. Breast cancer activism is the major reason for the awareness of such issues. Breast cancer activists in the US gained representation in research funding committees and influenced allocations of funds to breast cancer research. Though there is a long history of breast cancer activism using various tactics to support their cause, the current use of graffiti to spread awareness is an interesting sociological phenomena that resonates both with the history of the social use and meaning of graffiti as well as graffiti’s use as a politically charged tool used to combat the HIV/AIDS epidemic. Historically, graffiti was part of a social movement aimed at reclaiming control of the public space. These movements sought to highlight the power of graffiti’s inherit resistance to the social control of public space. As the movement progressed, the scope of the initial goals began to widen, though still feeding off the protest-centered nature of the art form. A highly renowned artist, Keith Haring, engaged in the early 1980’s Graffiti Art movement in New York began to chalk his pop-culture influenced and fun-loving art work on subway platforms in order to have his art reach a diverse public. After being diagnosed with HIV, Haring began to use his democratic approach towards graffiti-art to further spread awareness of the HIV/AIDS epidemic. At first his work was continuously painted over, but over time he became so well-known and appreciated he began being employed on public art projects, public announcements and commercial campaigns, including the United Nations program, Fight AIDS Worldwide. This particular program organized to increase awareness and advance medical research concerning the HIV/AIDS epidemic. While this is just one example, studies show using public art as a means of creating awareness towards HIV/AIDS result in not only more medical research, but rearticulate the meaning and treatment towards those living with this disease. In sum, this visual analysis reminds us that despite the continuous attempts of city officials to cover up the work of street artists, the history of using art as means for social change cannot be painted over. Furthermore, this image highlights the strong similarities between the graffiti movement and the current breast cancer awareness movement. The “Breast Cancer Awareness” piece publicly displayed here exemplifies that like the graffiti movement, which seeks to reclaim public space, some members within the breast cancer awareness movement are currently using graffiti to reclaim a voice among a history of breast cancer that has been plagued with silence. Wechsler, Lorraine. Introduction to Encyclopedia of Graffiti, New York: Macmillan, 1974. Zola, Irving. "Medicine as an Institution of Social Control." The Sociology of Health & Illness: Critical Perspectives. New York: Worth, 2005. U.S. Cancer Statistics Working Group. United States Cancer Statistics: 1999–2006 Incidence and Mortality Web-based Report. Department of Health and Human Services, Centers for Disease Control and Prevention, and National Cancer Institute. Batt, Sharon. Patient No More: the Politics of Breast Cancer. Charlottetown, P.E.I. : Gynergy, 1994. Echeverria E, Lambrechts S, Milesi ML, Diaz S, Silva R, Cano M. Producing HIV Health Through Art, International AIDS Conference.1998. The power of this photograph rests in the irony it conveys. How ironic that it is the man-made technological advancement, the railroad, which leads the eye to one of nature’s finest masterpieces, the mountains. Since antiquity, people have been concerned with the impact of technology on both the social and natural world. 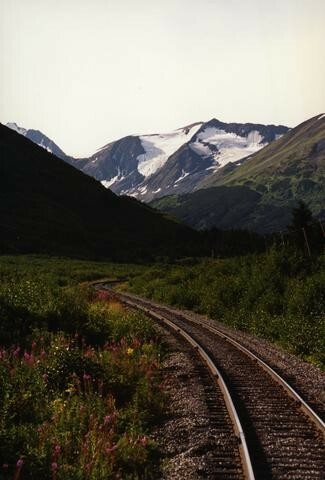 Thus, by photographing the trail of the train tracks into the mountains it begs the audience to ask themselves, “Where does technology lead our society—closer to nature or further away?”; ” What impact will technology have on nature, our relationship with the natural environment, and human interaction?" It is these types of questions that led to the birth of the Social Sciences, which is rooted in an interest of the relationship between technological advancements and human relations. The most notable social scientists of the 18th and 19th century, Karl Marx, Emile Durkhiem, and Max Weber, were writing as witnesses of the shift from agricultural industry to industrialized factory based industry. They noted this shift in the mode of production was instrumental to the rise in capitalism, which these three theorists feared would negatively impact the organization and behavior of society. Such broad concerns are highlighted in this photograph, but more so this image draws attention to a specific 19th century technological advancement, the railroad and its impact on society. The railroad is regarded as one of the most significant instrument to the progress of our society. It helped pave the way for the social and economic possibilities and opportunities that exist in our modern society. Given this, the railroad is a symbol of both progress and democracy. Rail roads made it possible for fast and efficient transportation across great distances, conjoining distant towns to modern cities. This provided the chance for those who were at a geographic disadvantage the possibilities to advance both their economic and cultural capital. Many people, regardless of their socioeconomic status, could afford the price of a train ticket. Because of this, the railroad was seen as a technology that would further advance democracy. Looking critically at the history of the railroad, one can see this technology was riddled with false promises of progress and democracy. The railroads became a site for extreme exploitation among workers, thus only benefiting the few wealthy initial investors of this innovation. Furthermore, this technology has left a permanent carbon footprint on our environment, which is a problem we continue to face when finding solutions to the current global climate crisis. Even though the railroad may not have kept it’s original promises, one can not deny the fact that the railroads truly altered the way in which society functioned politically, economically, culturally and socially. The railroad had the ability to transform the understanding of time and space from limitations to possibilities. Thus, allowing people to travel to new lands and utilize resources. As Marx, Weber and Durkhiem feared, this technology provided early capitalists the opportunity for further exploitation of natural resources and human labor. In addition, the railroad offered society a technologically-mediated experience with nature that continues to shape how individuals experience both the social and natural world. In conclusion, the railroad was one of the first baby steps towards a technology-based, globalized society. The railroad radically shifted society’s ideological framework by reconstructing prior limitations of time and space, which allowed for various social groups to circulate ideas, commerce, language, and culture despite geographic location. Society continues to manage the implications of this ideology as well as the real consequences of technology, both positive and negative, this has on all individuals and the land they inhabit. The invention of the railroad highlights how technological advancements exploit human labor and the ways in which these advancements impact the global climate. Schivelbusch, Wolfgang. The Railway Journey: the Industrialization of Time and Space in the 19th Century. Berkeley, Calif.: University of California, 1987.